83 days left in the Blush, Blush Baby Giveaway! 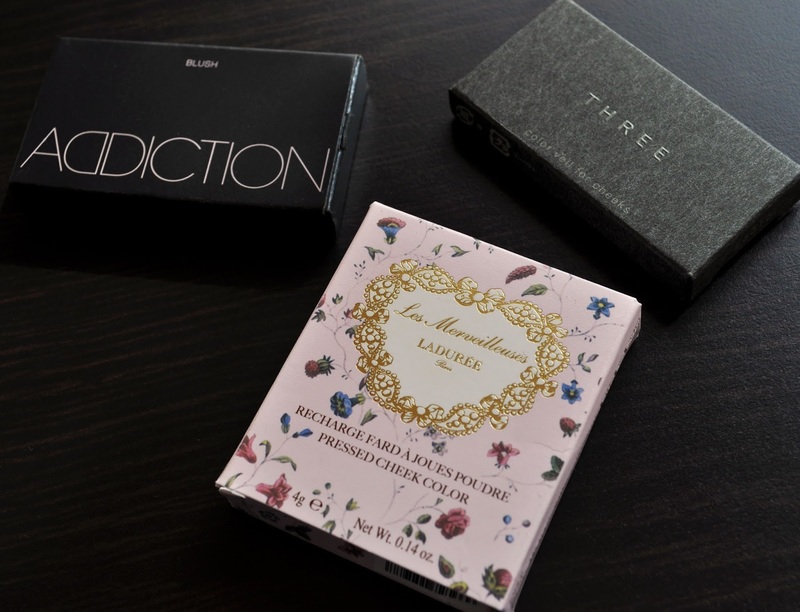 The first place winner receives one blush of your choice from each brand: Addiction, THREE, Laduree, Suqqu, and Chicca. The second place winner gets a blush of their choice from one of the following brands: ADDICTION, THREE or LADUREE. The third place winners get a blush of their choice from one of the following brands: THREE or LADUREE. What you have to do: in the comments, please list your favorite blushers, what upcoming blushes are you pining for, and what Addiction, THREE, Laduree, Suqqu, and Chiccs blushers would you choose. All gorgeous members (via the members section on the blog) automatically get one entry. So, don't forget to click the "Join this site" button. For every blog post, tweet, or whatever form of social media you use, mention the giveaway, and you'll earn another two entries per mention (please link the post in the comments, thank you!). The What Makes You Blush Giveaway ends on August 9th, 11:59p.m. (GMT+9). If you have any questions, feel free to message me in the comments. Thank you for entering anonymous. The giveaway is finally coming to an end, hope you're subscribed! My three favorite blushes (if I have to chose) are Estee Lauder's Sensuous Rose, Elizabeth Arden's Ceramide Cream Blush in Nectar, and Rouge Bunny Rouge's Starina. I would chose Addiction's Revenge, the Laduree Pressed Cheek Color in #22, Three's Into the Aether, the SUQQU Balancing Cheeks in 01 Momoshuiro, and the Chicca Flush Blush in 09. Out for your three favs, I haven't tried the one from Elizabeth Arden; must remedy that! My favorite blushes are MAC softdew beauty powder and the Shiseido Camellia Compact. My favorite blush at the moment is a blush by Too Faced. The one shaped like a heart and has several different colors. I would really love the Sometime blush by Addiction, THREE 01, Laduree pressed cheek powder in 03, SUQQU Balancing Cheek Blush in 02, and Chicca flush blush 01. I've had those Heart-shaped Too Faced blushers on my list for some time now. Thank you for your entry Crystal. I'll be announcing the winner on the 16th. Le Blush Creme de Chanel in Cheeky. I'm all for a good cream to powder formula, so the blushes I'm most excited for are the blushes Suqqu Summer '16 Eye and Cheek Color Compacts in EX-01 Rikkakou and EX-02 Natsuyuuka. I have all three of your top blushes, and they are beautiful! Thank you for participating in the giveaway, and for the twitter and Pinterest links. My favorite blushes are the matte series for the canmake cream cheeks. Before they were discontinued I loved the Sonia Rykiel cream blushes as well as pout cream blush sticks. What I would like to try are the new mini blushes from Laduree and the new cream blushes from three. Thank you for another great giveaway Liz!!! I still mourn the loss of my beloved Sonia Rykiel. Thankfully, I was able to get backups of everything. Now I use them sparingly.